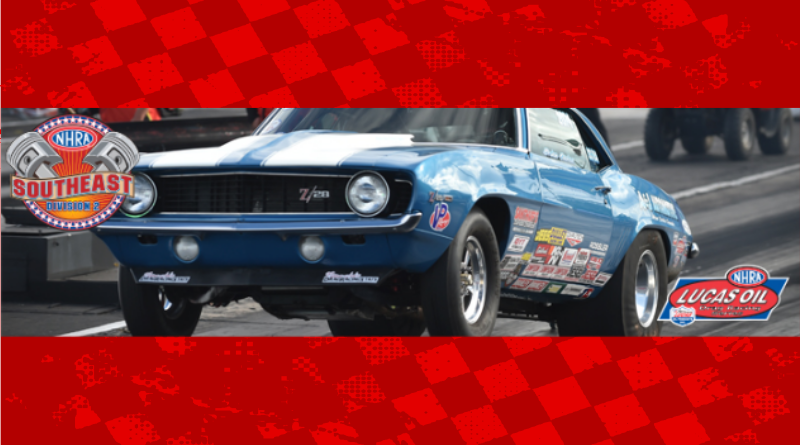 ROCKINGHAM, N.C.– In the final results from Rockingham Dragway and the NHRA Lucas Oil Drag Racing Series, home track and second-generation racer Hillarey Sloan took home the win this weekend in Super Stock. Sloan faced off against Bryan Worner, Dunnigan, Pa., and posted a winning run of 9.855 seconds, 131.22 mph in her ’09 Duster. Worner was quick of the line but could not hold off Sloan with a slower run of 10.121 seconds and 123.93 mph making this Sloan’s first career win. Van Puckett, Monroe, Ga., and Mike Robilotto, Albany, N.Y., took home the wins in Comp Eliminator and Super Comp respectively. Puckett worked his way through the field and ran 8.304 seconds at 140.55 mph in his final round victory over Frank Aragona, Freehold, N.J., who clocked in at 7.364 seconds, 173.90 mph. Robilotto faced off against Michelle Furr, Galax, Va., and posted a winning run of 8.953 seconds, 168.51 mph in his dragster. Furr drove to an 8.952 second, 169.49 mph lap for her runner up finish. Other racers visiting the winner’s circle this weekend were James Daniels, Yardley, Pa., Stock Eliminator; Justin Lopes, Lakeville Mass., in Super Gas; and Larry Paden, Chester Spring’s, Pa., in Super Street. In the division’s Stott’s Ford Top Sportsman class, it was Vonnie Mills, Kennedyville, Md., taking the win while Jeff Strickland, Red Bay, Ala., won in Hickory Enclosed Trailer Sales Top Dragster. This is the final race of the season for the Southeast Division racers. Van Puckett, Monroe, Ga., ’05 Cavalier, G/AA, 8.304, 140.55 def. Frank Aragona, Freehold, N.J., ’11 Neil, E/DA, 7.364, 173.90. Hillarey Sloan, Broadway, N.C., ’09 Duster, FGT/J, 9.855, 131.22 def. Bryan Worner, Dunnigan, Pa., ’90 Camaro, SS/JA, 10.121, 123.93. James Daniels, Yardley, Pa., ’83 Camaro, H/SA, 11.395, 113.31 def. Adam Badgett, Mount Airy, N.C., ’15 Copo, FS/E, 10.203, 129.37. Mike Robilotto, Albany, N.Y., Undercover, 8.953, 168.51 def. Michelle Furr, Galax, Va., ’02 Undercover, 8.952, 169.49. Justin Lopes, Lakeville, Mass., ’63 Nova, 9.914, 159.04 def. James Sessoms, Suffolk, Va., ’81 Monza, 9.865, 153.39. Larry Paden, Chester Springs, Pa., ’88 S-10, 10.932, 131.52 def. Leland Poppell, Odum, Ga., ’94 Achieva, 10.876, 138.12. Jeff Strickland, Red Bay, Ala., ’14 American, 6.829, 144.13 def. Greg Gallagher, Deltona, Fla., ’07 Undercover, 11.799, 68.27. Vonnie Mills, Kennedyville, Md., ’06 Cobalt, 6.762, 202.27 def. Michael Cerro, Mineola, N.Y., ’63 Corvette, 6.929, 195.59.